1985! 1985! Such a cool and modern time! That was thirty years ago. THIRTY YEARS AGO. We had a sick day earlier this week and were looking for something awesome to share with the boy. I’d been thinking about Back to the Future, since, as we all know, this is the year that Marty and the Doc travel to in Back to the Future II. People have been scrambling to make that future vision a reality, from really unimpressive hoverboards to Nike’s Air Mag with self-tying laces. All that is well and good, but if you are going to start fresh, you have to start at the beginning. I can’t say how many times I have watched that movie. Apparently a lot because I can recite most lines from memory. I like this movie because it’s totally fun and it’s harmless. There are a couple words in it I had to gently remind my child that he is not allowed to say. But overall the whole time travel/awesome car/action movie was not lost on the kid at all. He even has a puffy vest like Marty McFly is wearing when he goes back to 1955! Whenever he wears it, I say, “Hey kid, why you wearing a life preserver?” It’s great fun. If you haven’t watched it in a while, Back to the Future is still a pretty fun thing to watch. It’s classic Steven Spielberg good times, from the same era of E.T. and The Goonies and Raiders of the Lost Ark. 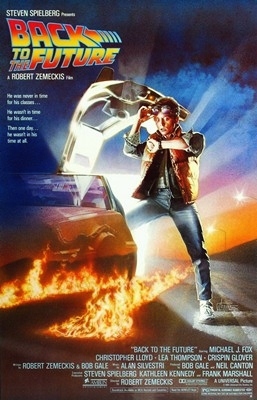 What better way to wrap up a long day than with a trip back in time, in a meta-nostalgic movie, in a sweet DeLorean?